A fun wintertime activity made more fun with a handmade sled! Spend countless hours on the snow with the Colorado Kicksled by Mountain Boy Sledworks. Popular in Scandinavian countries, the kicksled has a chair mounted on a pair of flexible metal runners which extend backward to about twice the chair’s length. You stand on the metal runners and kick the ground with your foot to propel the sled forward. 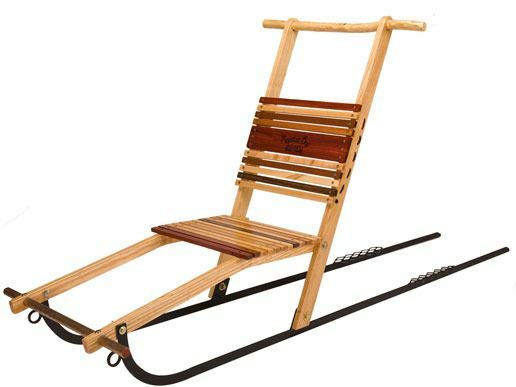 Each unique Colorado Kicksled is signed and numbered on the bottom by the sledmaker and is made from American white ash with a comfortable slatted seat and a hand-carved, polished native willow branch handle. A work of art and an entertaining way to enjoy the winter snow!